There's a pretty good crowd for the various shows, with eager volunteers. 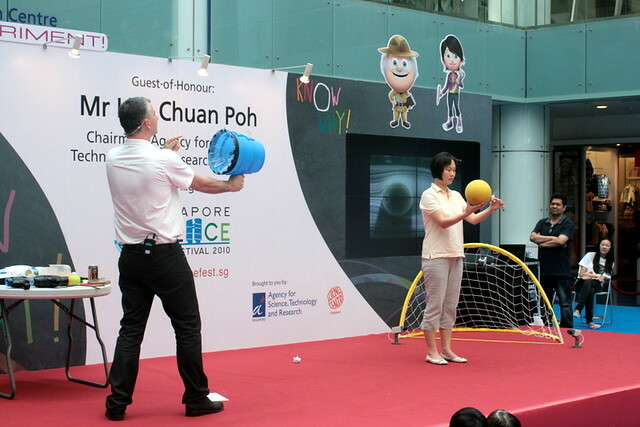 We saw some kids with special needs at the event too (not necessarily in this photo). Last year we had Dr Bunhead with his explosive stunts. 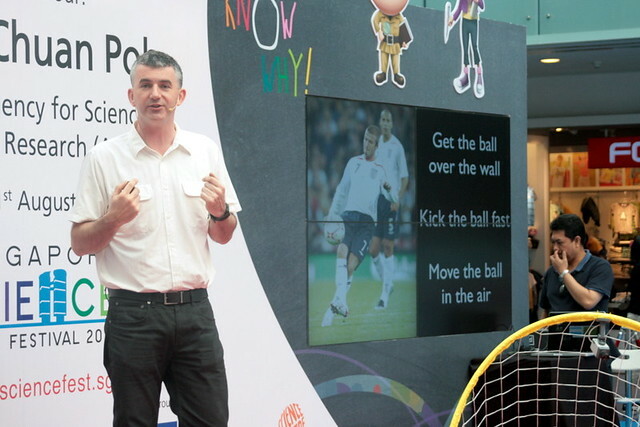 This year, we have science educator James Soper performing his popular show, "Bending It Like Beckham" showing how scientific laws from Galileo, Newton and Coanda apply to making the best free kick or penalty kick. 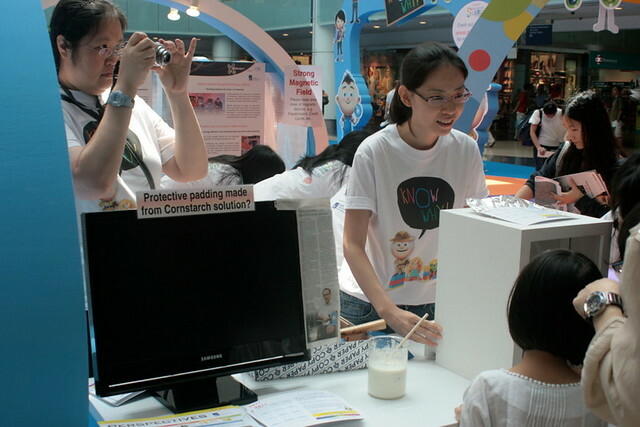 There were a lot of interactive demonstrations. This one shows the Coanda effect (fluids like to follow nearby surfaces like curves). The air blast went around the ball to extinguish the tiny candle flame shielded by the large ball. I also saw thick cornstarch used like I would never believe it. It's soft and fluid at rest, but becomes rigid upon impact - like when it's hit by a bullet. Move over, Kevlar, this is the new bulletproof technology. Shear thickening fluid composite, to be exact. There are applications for flexible body armour, drilling fluid and wheel drive systems using viscous coupling units for power transmission. Don't believe it? Try it for yourself. Put two M&Ms or Skittles on a board for hammering. 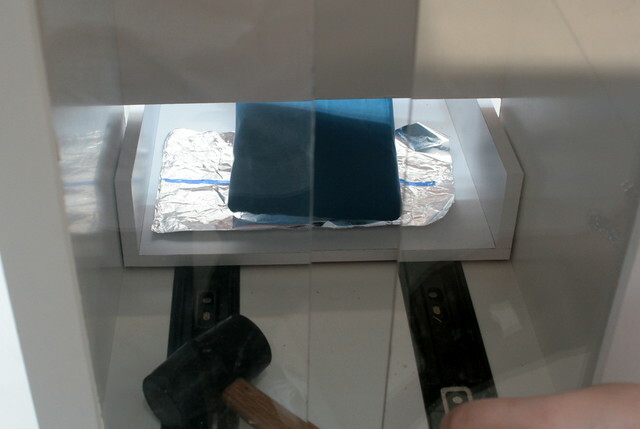 Place the shear thickening fluid composite slab on top of it - it feels very light and malleable. Hammer away!!! But the candy remains amazingly unbroken. Not even a crack. 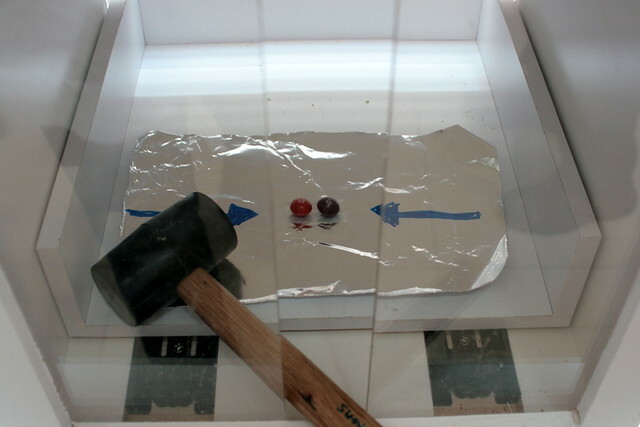 You get to repeat the hammering with a regular sponge (above) for comparison, and see that the candy is smashed into smithereens! 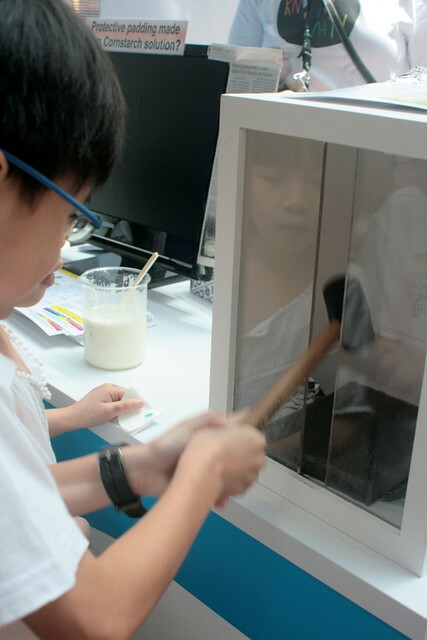 You guys must check out the Slime-making exhibit too. Yes, slime! 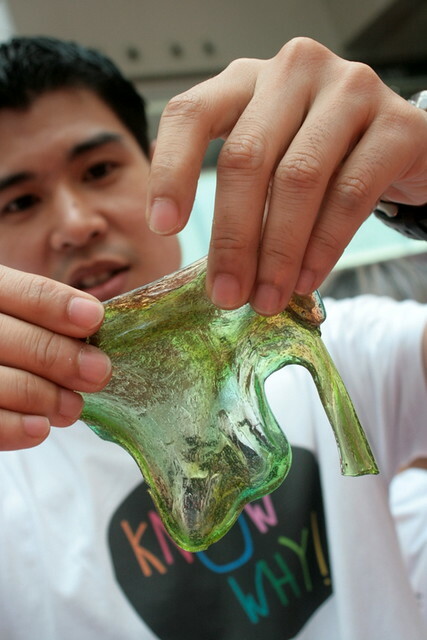 Just mix polyvinyl alcohol with a bit of borax (note slime is not for eating!) and choose your colours. These kids can't wait. 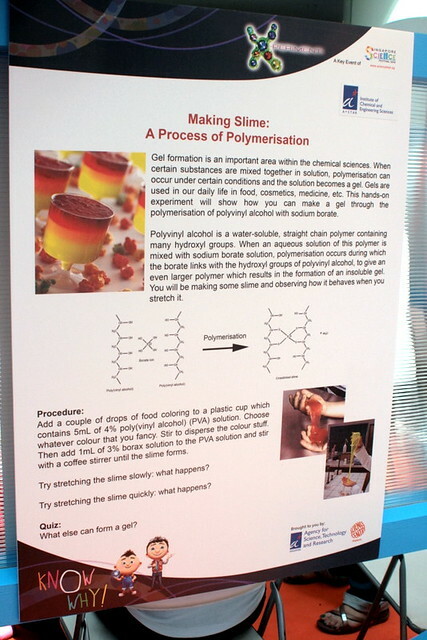 But it's really simple science behind it - polymerization. 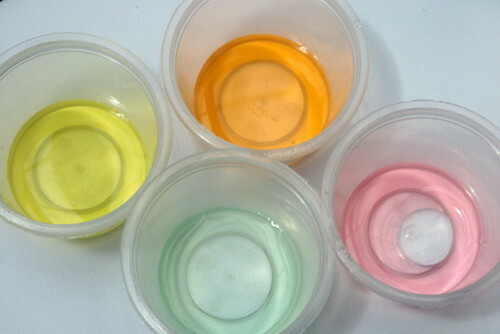 OK, now you can go make your own slime-filled horror movie. 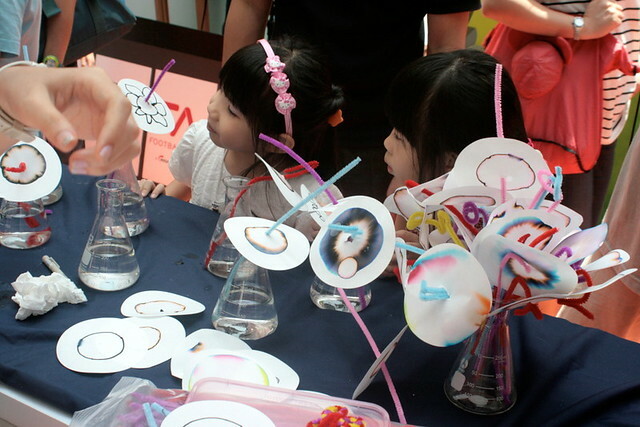 These kids are seeing how black ink disperses into many different colours - great effects for making flowers. 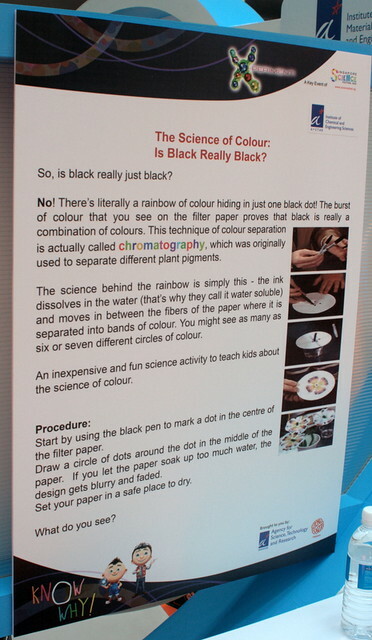 The process is called chromatography. There was one exhibit with flavoured drinks for you to sample. But you have to guess what flavour each one is. I was stumped because of the colours (green one is strawberry, and pink one is green apple). Amazing how our brain gets confused when the flavours don't match the colours we are used to tasting. 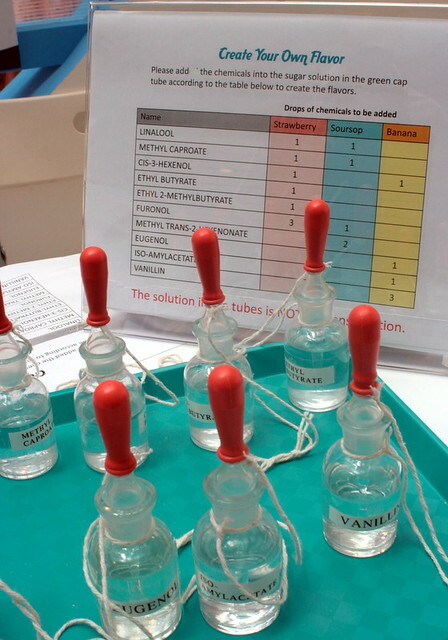 You can also try mixing chemical compounds to concoct fragrances. 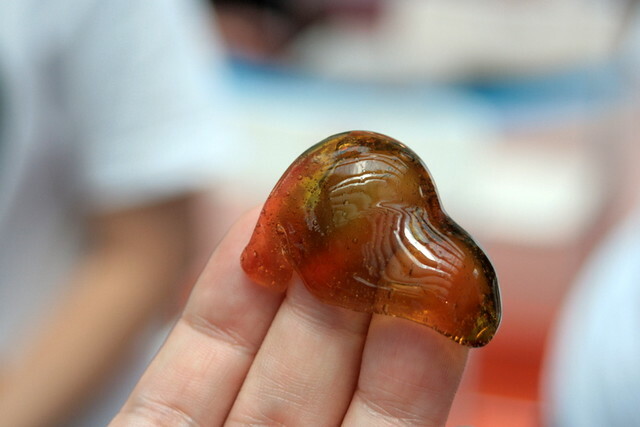 I made a banana one (three drops of vanilin - one of my favourite scents). 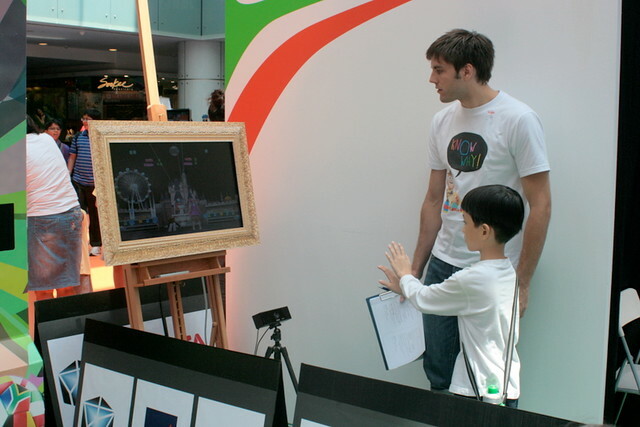 There were other displays like some remote manipulation of a game, and also a booth for 3D dancing. 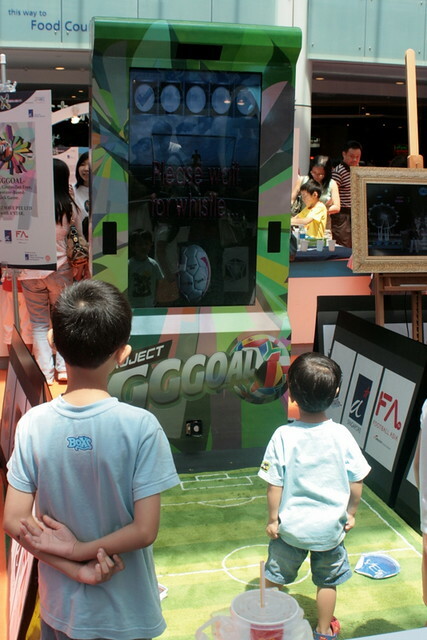 And this looks like what arcade games could be like in the future. This looks impressive! Some RoPe-bot? 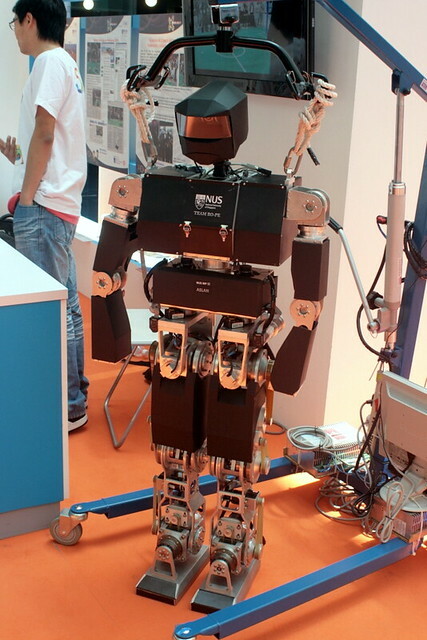 It won 1st prize in the Singapore Robocup 2010 competition. I don't know if they do set it loose for a walk, but there's a video demo of it at the site. There were other booths I didn't get to explore. 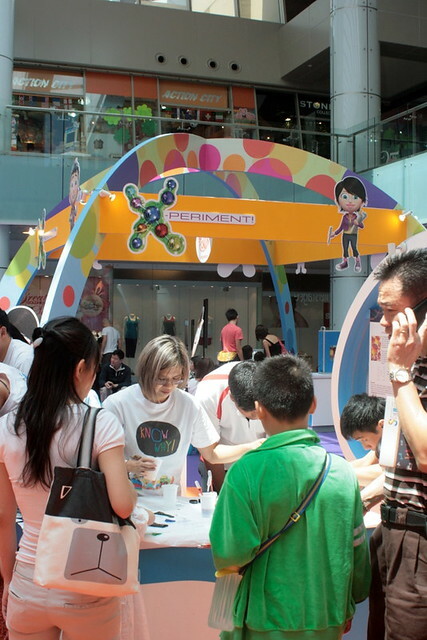 But X-periment looks like a place to spark kids' interest in science, and also widen adults' knowledge and awareness of scientific applications in our lives. Hurry, you can still go tomorrow. 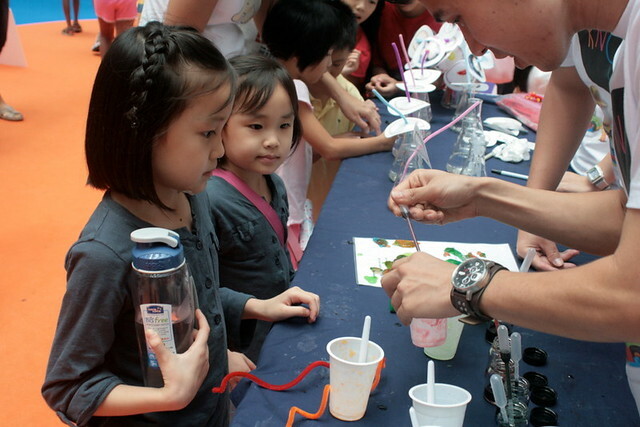 Meanwhile, check out www.sciencefest.sg for other Science Festival program events over the next three weeks. There's a Science Challenge, Gene Fest, Sci-fi Movie Festival and Forum, the Great Mass Activity (record-setting Coke-Mentos geysers!) 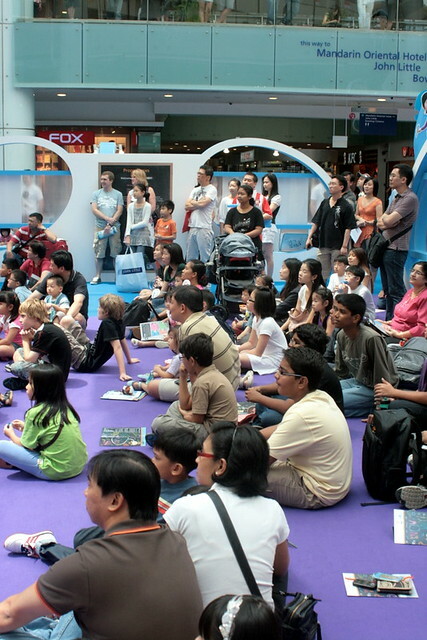 and a Kids Science Fest. 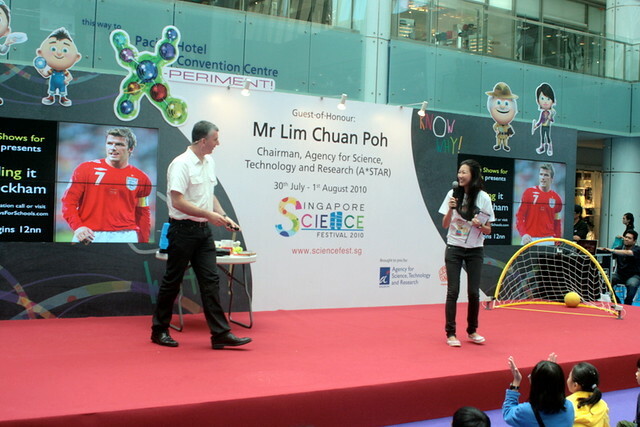 The Science Fest is jointly organised by A*STAR and Science Centre Singapore. That looked amazing. Nice post. Chenyze: Yes, actually adults stand to learn a lot from this too!